Static Image Lesson : Creating a Poster for a 'Client'. In my previous post, I explained how I introduced Static Image/Visual texts to my class of year 9 and 10. After the 3 part introduction I then decided that the students were ready to take on a 'Static Image Challenge'. I had a double period and started the class with my challenge criteria. I told students "Today, you are no longer students - you are employees of an advertising agency!" 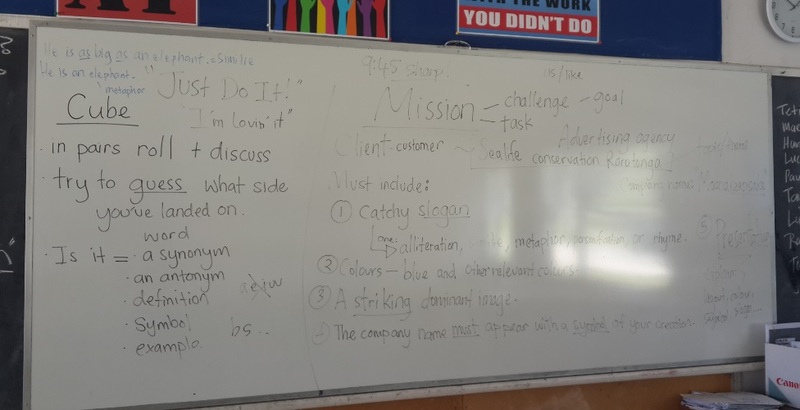 The class looked a tad puzzled, but I quickly quizzed them on what an advertising agency does, and gave a short example of how the Nike sports brand pays advertising agencies to create posters, commercials and billboards for them, etc. Fun fact my students enjoyed - the Nike swoosh (or tick) "has become one of the most recognizable brand logos in the world, and the most profitable...worth of $26 billion alone." 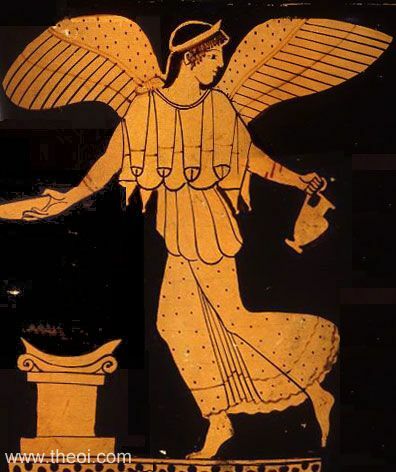 Also, the swoosh is symbolic as it represents "the wing of Nike, the Greek Goddess of Victory, from which the company derived its current name." 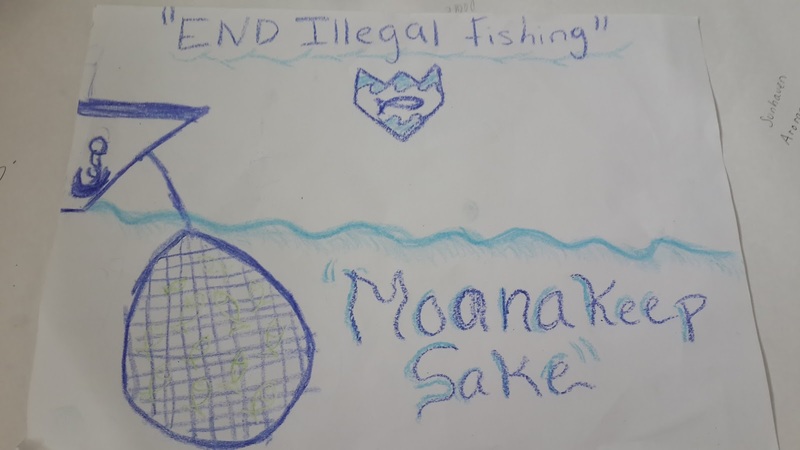 "Your job today, is to design a poster for a client from Sea life Conservation Rarotonga. 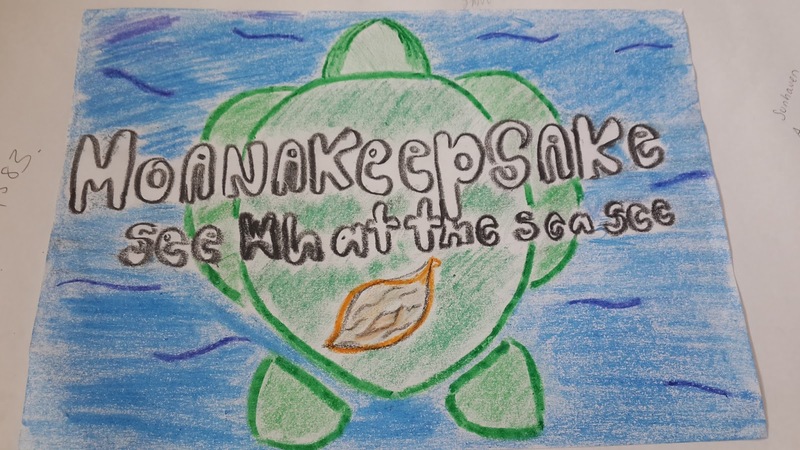 Their company name: Moana Keepsake." (Moana means ocean in most Polynesian languages, including Rarotongan Maori). "Now, this is a competition - your client will visit the school today and judge your advertisements. The winning team will receive a prize." The "client" - my mother , the prize - slices of her freshly baked coconut cake. "In order to win, your advertisement must include the following..."
Next, I explained the criteria for this group project, what features the advertisement needed and what the client requested. I wrote it out on the board while explaining. The students were eager to get started. A Catchy slogan - must have one of the following within it : alliteration, simile, metaphor,personification or rhyme. Relevant Colours - blue and other relevant colours of your choice. (Client has requested blue specifically as one of the key colours). The company name & logo - The company name must appear with a symbol (logo) of your creation/design. 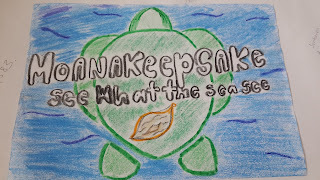 Remember, the company name is Moana Keepsake. 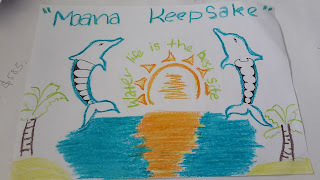 I told the students to look up the word keepsake if they didn't know it, to help them with their symbol. 5. A Presentation - they must present their advertisement to the client with thoughtful reasons - why they chose certain colours, images, etc. Everyone in the group must talk. For about an hour and a half the students worked together, colouring, drawing, planning, re-starting and repeating. They practiced their presentations and the client (my mother) arrived cake in hand, ready to judge the best poster. Now, they are missing the company name - however, due to their brilliant presentation which included the most thoughtful explanations behind their design choices, they were crowned the winner and received coconut cake (the rest of the class ended up with some, too). "The Sea is Where We Must Be" is our slogan and we chose rythme so that it would be catchy and easily remembered. 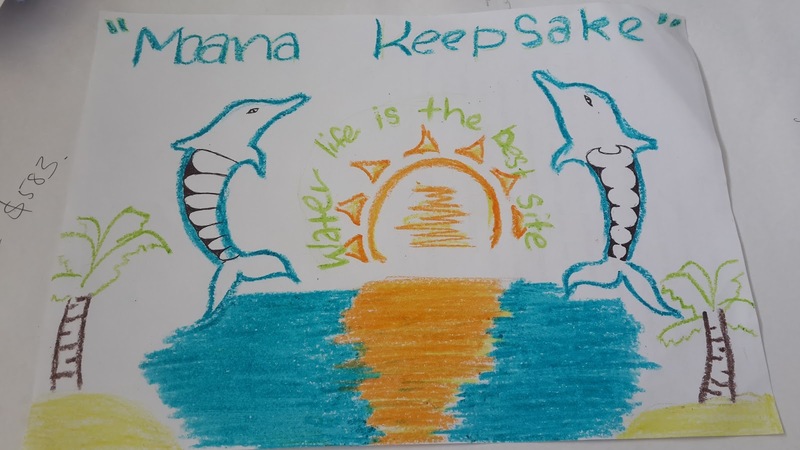 We also think the sea is important to polyneisan culture, especially Rarotonga which is where the company is from, so we know that the word "be" makes sense as we are always by and in the sea." "We chose blue, because it relates to the ocean and saving the ocean which is the company's goal." "Our logo is a circle and a wave inside of it. 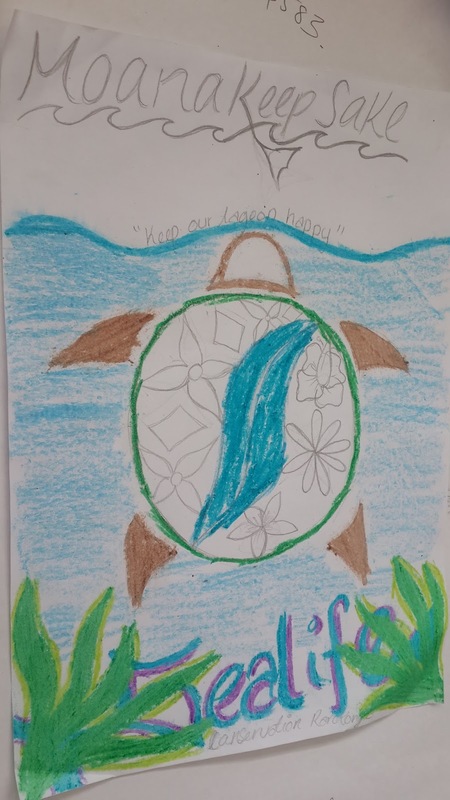 It's simple but we think it will be easy to recognize and it shows the sea and the circle shows that everything inside it is important." 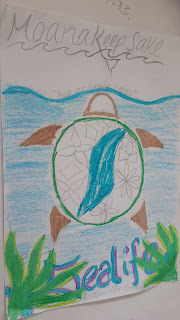 "The water in the circle is darker because it is more healthy. 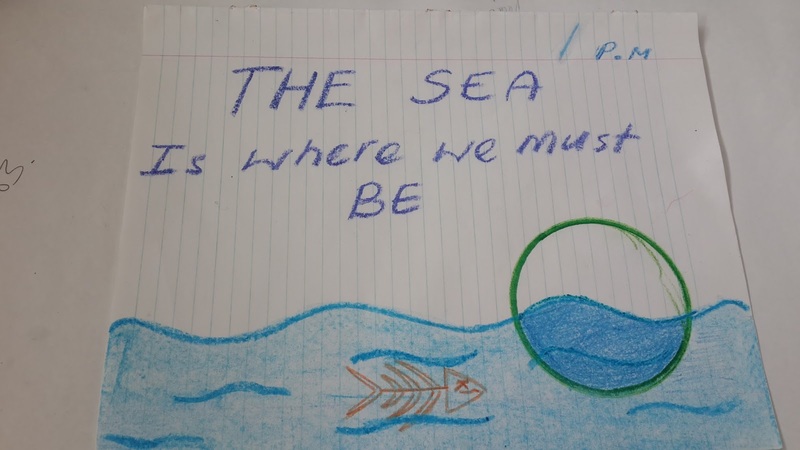 The water in the rest of the image is lighter and the dead fish is a part of our dominant image to show the sea needs help, animals are dying." "See what the sea see" - missing an s there. "Water life is the best site" - nice pun. (I went last, and obviously didn't participate in the competition but I wanted to present to show them what is expected of them when they explain a visual text/static image). "Stop selling our shells homes." I played with the idea of a homeless hermit crab as those creatures need shells to survive. My background is an image of a smiling woman with a pretty shell necklace. The foreground image is of a hermit crab, appearing homeless, on the side of the street, it is my dominant image. I chose to have my layout include 3 separate parts to my poster so that the dominant image was in the centre to attract the most attention. I drew a box in place of a shell for the hermit crab to show he had lost his home/shell. And another piece of important text in my poster appears in the hermit crab's sign that says "Will work for krill". I chose these words as the commonly known sign 'will work for food' is used often by the homeless in media/pop culture, I replaced 'food' with 'krill' as that's an ocean food for many crustaceans. Another bit of text in my poster is an imperative because I wrote "Think of the hermit crab." I used a block letter style font to make it seem important and grab attention. The font is inspired by stop signs seen on the road, they have a thick and white font that pops out on top of colour, I wanted the same effect but with blue and white. It's also written in capitals which also makes it have a serious tone. 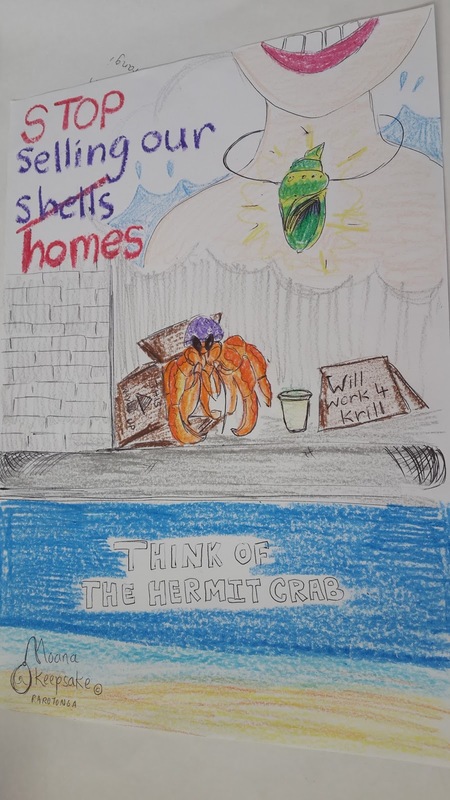 I used the colours grey and brown around the hermit crab to make a gloomy atmosphere to reflect the sad homelessness of the crab which is a stark contrast to the vibrant blue below and bright green shell and pink lipstick of the woman above. My slogan 'Stop selling our shells homes' has the use of alliteration and personification of the hermit crabs as the idea of a 'home' is a human concept. My logo has the company name 'Moana Keepsake' written within it and I chose to draw a pearl earring as it helps to symbolize the word keepsake. Also, pearls are very precious to Polynesian people and they come from the ocean, so it all relates back to the company name. A motif in my poster is the presence of the ocean. In the foreground image, the woman has ocean waves behind her. At the top of the dominant image the grey walls of the hermit crab's sidewalk have a wave pattern edge. Finally, the bottom panel of my poster is made up of ocean colours, blue and light blue to symbolize the sea shore and breaking of the waves on the sand plus, the sandy blend of orange and yellow that finishes the image. This is to remind the viewer that this poster and company is all about 'Moana' - the ocean. I hope this gives you ideas for your next class on visual texts/static images! It worked great for us and lots of thought provoking ideas bounced around the room. The presentation was a key element to this activity to get them thinking about explaining themselves and essay style answers.